Happy Pasquetta! That’s the holiday after Easter when Italians all have off from work and school and take off to the country for picnics and another day of rest. 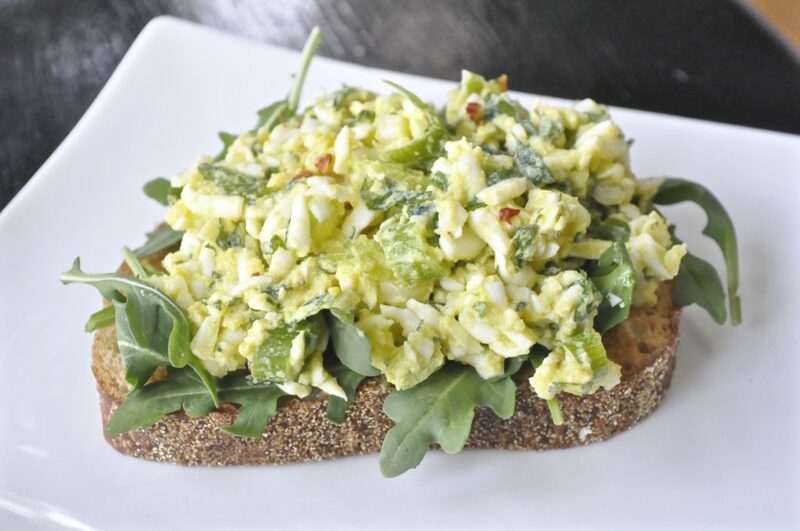 Typically, they eat cold foods like leftover frittata or pizza rustic, but many people have leftover hard boiled eggs too and use them for egg salad mixed with mayonnaise. 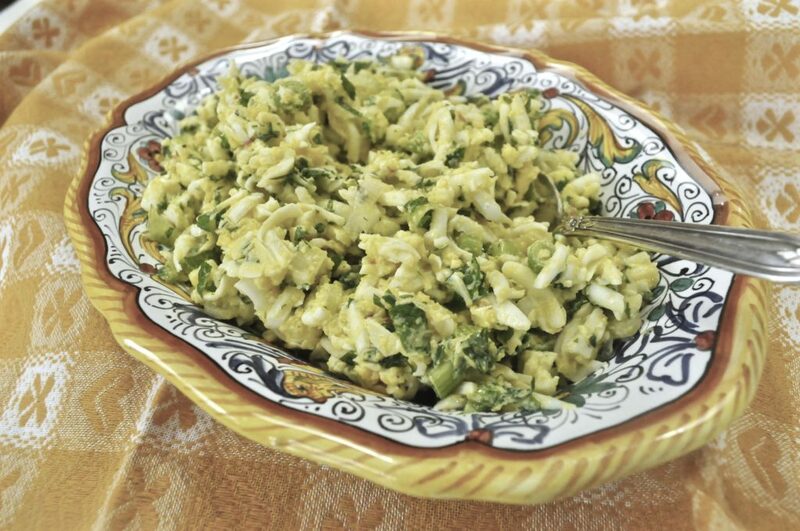 Instead of the typical egg salad, try this different version (no mayo at all) from culinary legend Paula Wolfert, the most famous cook you’ve never heard of. Born in the U.S., she’s written nine cookbooks and has lived in Morocco before it was a travel destination on every Millenial’s to-do list. 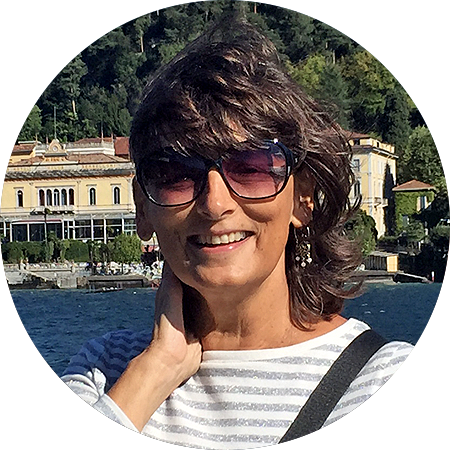 Sadly, she was diagnosed with Alzheimer’s disease, and the book “Unforgettable,” by Emily Kaiser Thelin, tells of her journey from a childhood in Brooklyn, to living around the world and bringing her recipes to American cooks through her cookbooks and magazine articles. The book also addresses Wolfert’s disease and how she is dealing with it through a brain-healthy diet. If you’ve never heard of her before, you’ll learn a lot about this influential cookbook writer in this book, and find lots of intriguing recipes too, including this one for a mint-laced egg salad. Oh, and if you want a fail-proof primer on making perfect hard-boiled eggs, click here. 4 large eggs, boiled (see Ciao Chow Linda archives on "How to make perfect hard boiled eggs"
Using the large holes of a box grater, and working over a large bowl, grate the eggs. Add the mint, green onions, and red pepper flakes and mix well. In a small bowl, whisk together the olive oil and lemon juice to taste, then drizzle over the egg mixture and toss to coat lightly and evenly. I don’t know about you, but when I have overnight guests, I don’t generally leave them to fend for themselves when they wake up. At a minimum, if they’re early risers, I’ll show them where to find the coffee and cereal, of course, and have bagels and cream cheese, muffins or croissants available. More often than not, however, I’ll be up earlier than my guests, preparing pancakes, French toast, or eggs and toast for them. But for special occasions, like Christmas Eve morning, when we knew we’d be eating only one other meal in the day, (albeit a Lucullan feast), I splurge and make a casserole like this polenta breakfast bake recipe from The New York Times. It’s hearty enough to hold everyone until the big meal later on and much of it can be ahead of time. The bacon can be cooked and polenta can be made on the stove top the day before, leaving only the assembly and final baking to be done in the morning while guests are pouring coffee or tea. To make it easy for yourself, buy instant polenta (please – NOT the already made polenta in a roll), and cook the bacon on a baking sheet in the oven. You can cook both of these the night before (or even two days before.) Just lay out the bacon strips on a baking sheet and cook at 400 degrees F. for about 10-15 minutes, or until it reaches the crispness you like. 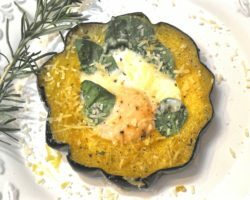 After you’ve made the polenta and added the cheese, pour it into a buttered casserole, and using a spoon or the bottom of a small bowl, carve out indentations for the eggs that you’ll crack into the spaces the next morning. Cover with plastic wrap or foil, and put everything in the refrigerator overnight. 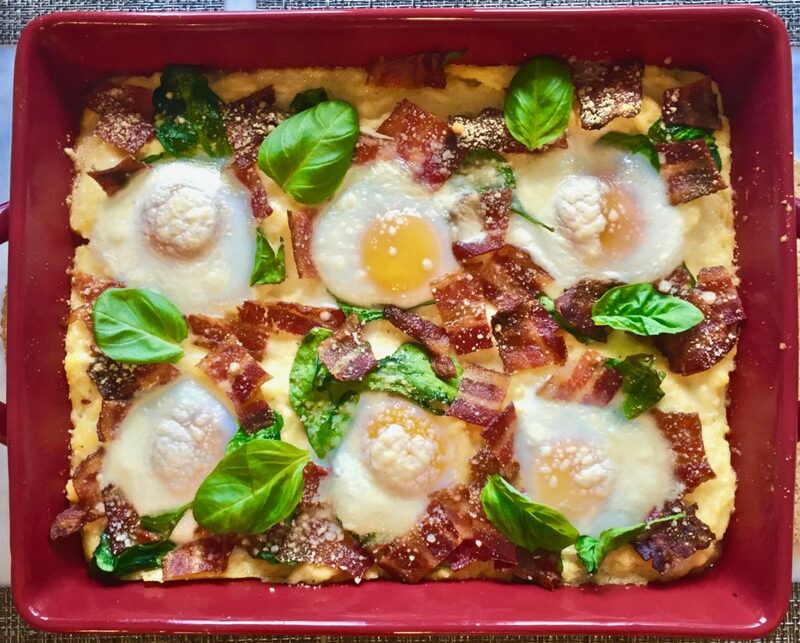 Just before you’re ready to bake the casserole, scatter some spinach leaves and bacon pieces here and there, and drop the eggs into the little spaces you created in the polenta. Sprinkle it all with parmesan cheese and bake until the desired level of doneness you prefer your eggs. I prefer the yolks to be slightly runny, but it’s difficult (at least for me) to get the whites thoroughly cooked without nearly overcooking the yolks. If you have a solution to that, let me know. When you remove the casserole from the oven, scatter a few fresh basil leaves all around, and enjoy. 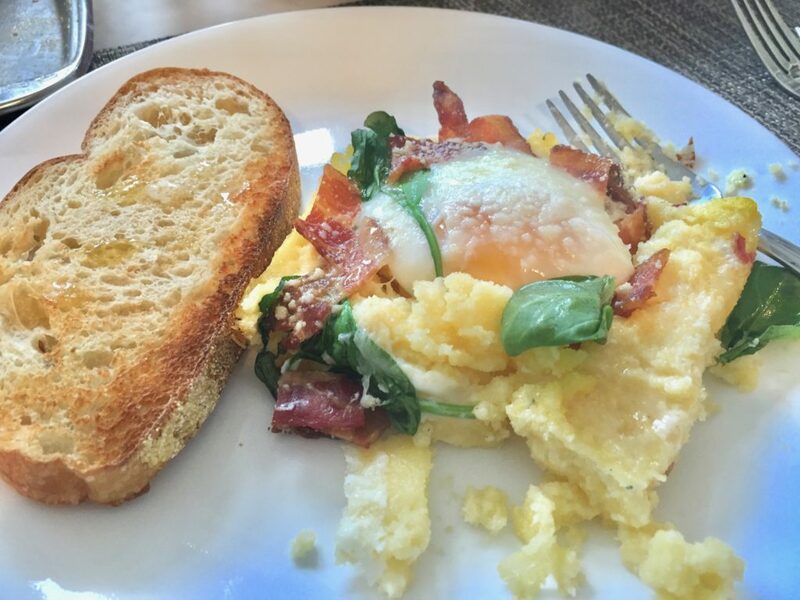 We loved this as a breakfast treat, but I wouldn’t mind sitting down to this for lunch or dinner either. I hope all my readers had a wonderful Christmas, Hanukkah, Kwanza or whatever holiday you celebrate. All my best wishes to you all for a healthy and delicious 2019. Generously butter a 9 x 13 inch casserole and set aside. Pour 4 cups of water in a large pot and gradually whisk in the polenta and salt. Cook, switching from a whisk to a wooden spoon, stirring constantly until the polenta bubbles and pulls away from the pan, about 3 minutes. Spread the polenta onto the bottom of the prepared pan. 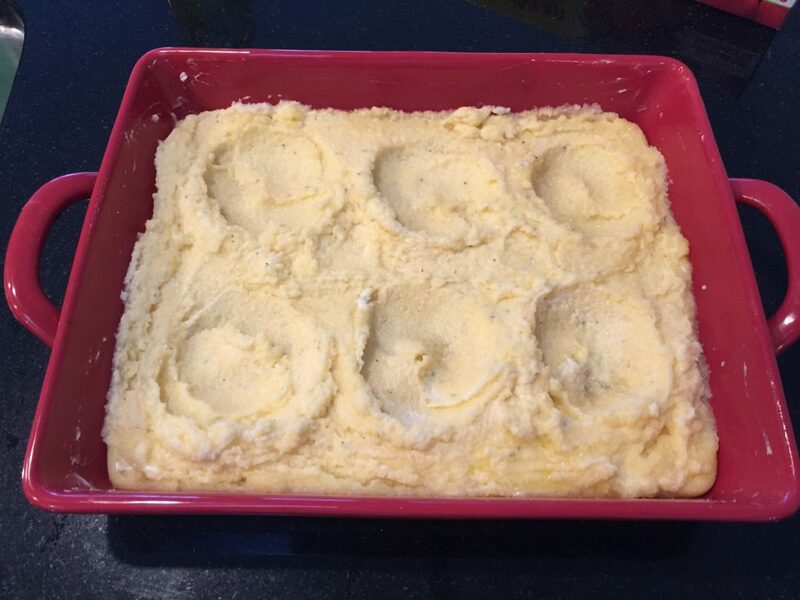 Using the back of a spoon, or a small bowl, make indentations in the polenta for the eggs. 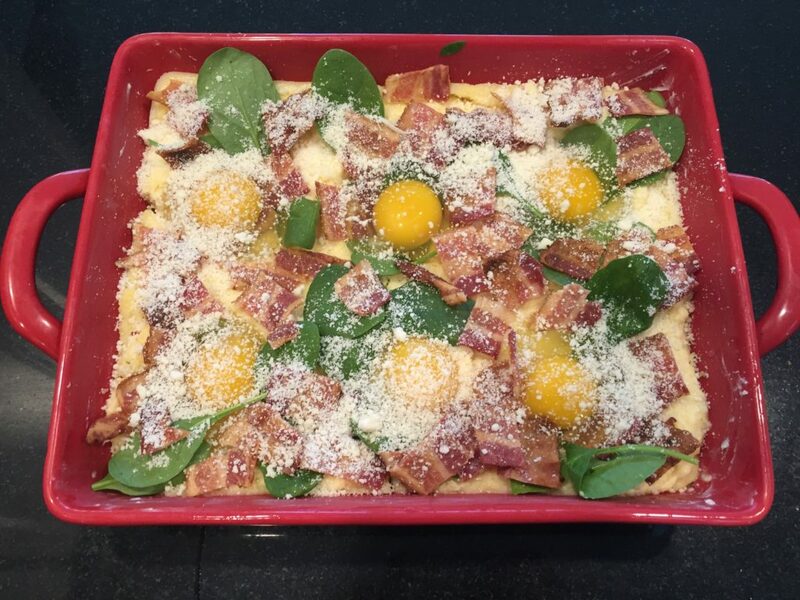 When ready to bake, scatter some of the spinach over the polenta and crack the eggs into the wells. Sprinkle with parmesan cheese and bake until the eggs have reached the doneness you prefer. After 20 minutes, my whites were just cooked and the yolks appeared a bit runny. I would have preferred them runnier, but the whites took longer to set than the yolks. 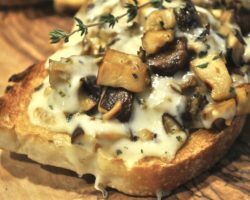 Sprinkle with black pepper, scatter some basil leaves over everything, and serve, with buttered toast made from good, sturdy bread. 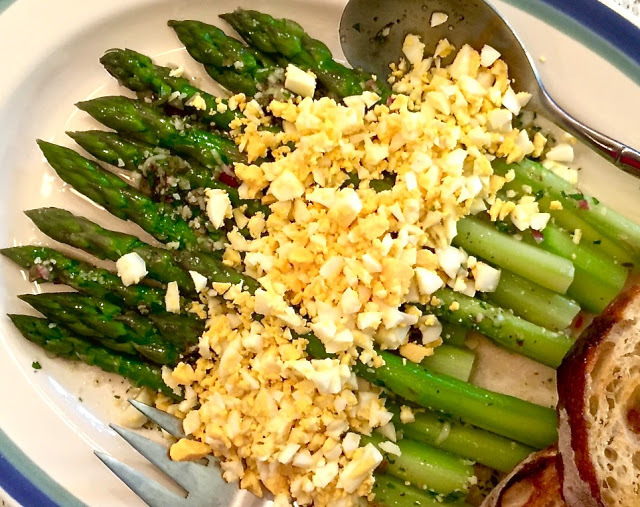 We’re nearing the end of asparagus season here in New Jersey – and fresh, local asparagus is one of the best things about springtime. Of course you can find asparagus nearly all year long, but when it’s locally grown and picked the same day you eat it, there’s a huge flavor difference. 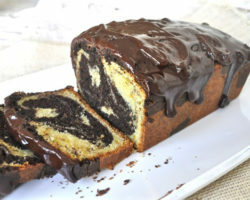 Still, this recipe can be enjoyed at any time. And as good as asparagus is, this dressing, with capers, red onions, and parmesan cheese, competing for your attention. The dish is so named because the chopped hard boiled eggs are meant to resemble the blossoms on mimosa trees. 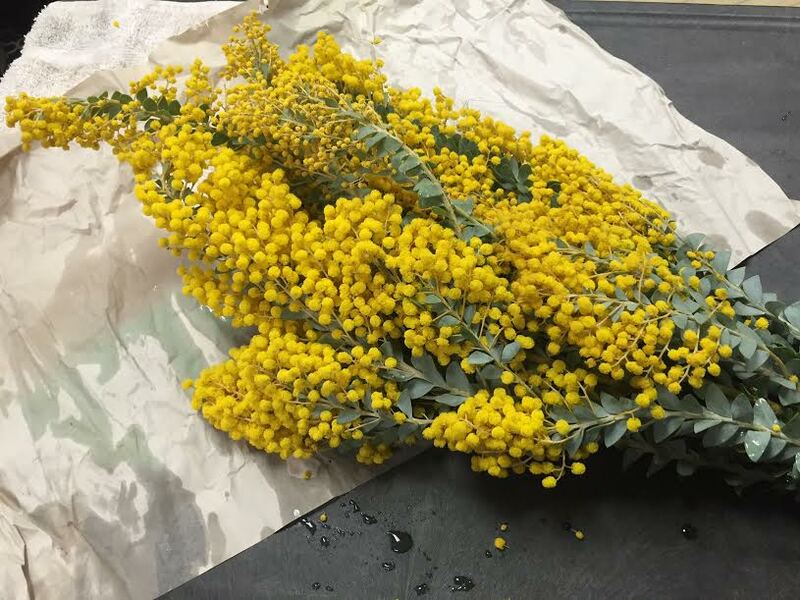 Unlike the pink blossoms on mimosa trees here in the Northeast U.S., in Italy, they’re yellow, and are traditionally given to women on International Women’s Day in early March. 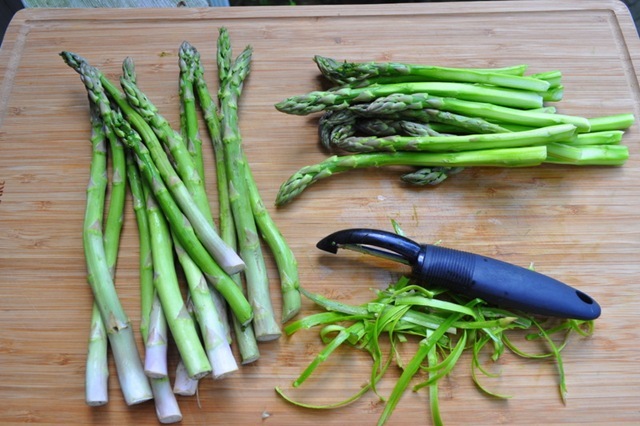 Make sure you peel the asparagus, in order to avoid biting into a fibrous stalk. It also reduces the cooking time. Cut off the bottom 1/3 of the asparagus too. Boil the stalks until they’re just barely fork tender, then remove them from the water and put them in ice water to stop the cooking. Wipe them with paper towels to dry them, then toss with the dressing, and top with the hard boiled egg that’s been finely chopped. 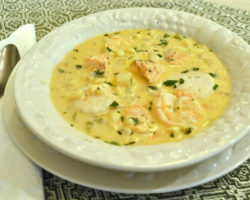 Serve with some crusty toasted Italian bread that’s been slathered with good olive oil and salt, and you’ve got yourself a delicious, well-rounded meal that contains all the nutrients you need. Peel the asparagus, then submerge them in a shallow pan of boiling water. Cook for about four or five minutes, until you can easily pierce a stalk with a fork. Drain the boiling water, then put the asparagus into ice water to stop the cooking (or run a lot of cold water over them). Dry the asparagus well with paper towels. Mince the hard boiled eggs finely with a knife, or pass through a sieve using a spoon. Mix all the ingredients for the dressing together, then toss the asparagus with the dressing. (You may have some leftover dressing.) 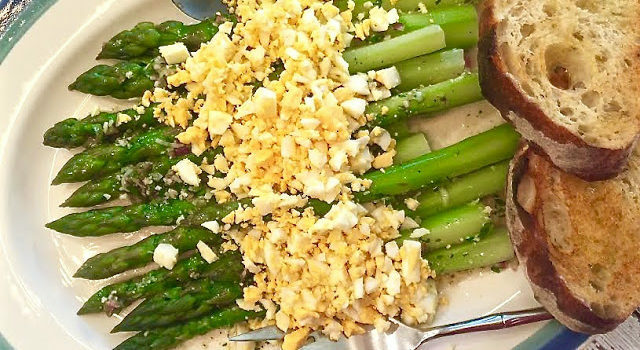 Arrange the asparagus spears on a serving platter, then scatter the minced hard boiled egg on top. Serve with good Italian bread that’s been toasted, smeared with olive oil and kosher salt. Who needs a tutorial on making hard-boiled eggs? Well, maybe you if you’ve ever started to boil eggs only to have them crack and burst open in the water, releasing a gush of egg whites. Or have you ever cooked them to the point where the yolks aren’t a creamy yellow, but rather have a greenish tint around the edge? Do you find it difficult to peel off the shell without a layer of egg white coming along for the ride? Come on now, fess up. Fear not, I’ve got a foolproof way to cook them to perfection, and easily peel them too, even if it’s a bit unorthodox. I’ve been using this method for so long, I don’t even remember where I first learned it. But it works every time, and I’ve been doing this for decades. There are many opinions on how to cook hard boiled eggs – start with cold water, start with boiling water, etc. My method starts with boiling water, but you can’t just drop an egg into the water without following these instructions exactly. First, you’ve got to pierce the eggs with the sharp tip of a knife or a large needle, or even a turkey skewer as I do. Poke a teensy little hole in the broader end of the egg. 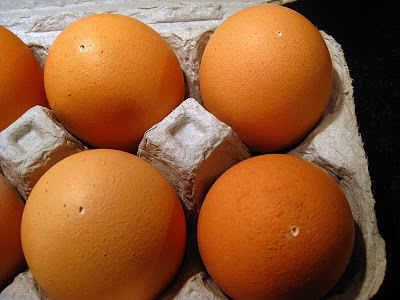 Look at the photo below and you’ll see a little hole in each egg. Don’t do this while they’re in the egg crate. You’ve got to hold the egg in the palm of one hand while poking a hole with the knife or needle, or any other sharp pointy object. Careful, because if you press the egg too hard, you could crack it and end up with a gooey, raw mess in your hand. Why should this work, you ask? Because if you pierce the egg and then put it into the boiling water, you’ll see little bubbles percolate out of that teensy hole. The egg is creating a seal as all the air immediately rushes out, keeping all the contents of the egg inside. It really works, try it! When the eggs are all in the water, set the timer to 12 minutes for medium size eggs, 13 minutes for large and a few seconds longer for jumbo. After the appropriate time is up, take the eggs off the heat and drain the water. Immediately fill the pot with cold water. Change the water two times because the heat from the eggs will warm up the cold water. You want the eggs to stop cooking. Now take each egg and crack it all around against your sink or countertop, but don’t peel it. Drop it back into the pot with the cold water. When you’re finished tapping all the eggs and putting them back in the water, start peeling. You’ll find that water has now seeped in between the cracks you made in the eggshell, allowing you to slip the shells off easily. Peel the eggs and slice open. 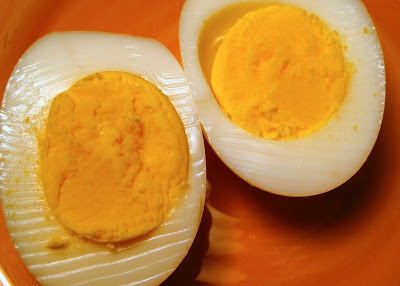 Inside is a moist golden yolk, and a perfectly cooked hard-boiled egg. 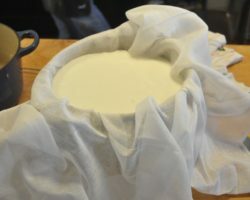 One caveat to this method is if the egg already has a crack in its shell, in which case you’ll find out as soon as you drop it in the boiling water because it will start to ooze its liquid immediately. Scoop it out immediately and save that one for scrambled eggs.